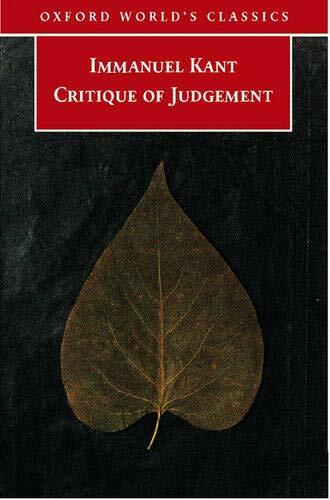 [PDF] Critique of Judgement (Oxford World's Classics) | Free eBooks Download - EBOOKEE! Description: In the Critique of Judgement, Kant offers a penetrating analysis of our experience of the beautiful and the sublime. He discusses the objectivity of taste, aesthetic disinterestedness, the relation of art and nature, the role of imagination, genius and originality, the limits of representation, and the connection between morality and the aesthetic. He also investigates the validity of our judgements concerning the degree in which nature has a purpose, with respect to the highest interests of reason and enlightenment. The work profoundly influenced the artists, writers, and philosophers of the classical and romantic period, including Hegel, Schelling, Schopenhauer, and Nietzsche. In addition, it has remained a landmark work in fields such as phenomenology, hermeneutics, the Frankfurt School, analytical aesthetics, and contemporary critical theory. Today it remains an essential work of philosophy, and required reading for all with an interest in aesthetics. No comments for "[PDF] Critique of Judgement (Oxford World's Classics)".